eBay has announced a trial with Argos in the UK to allow its users to purchase items online and then pick them up in a local store. Using the Click and Collect scheme from the high street retailer, 50 merchants will allow consumers to tap online and pick their goods up in 150 'primary' locations worldwide. eBay will also be piloting a one hour delivery service, eBay Now, in London in 2014 in order to get the things you buy online even faster. This is the first time the super-speedy US scheme has come to Europe. 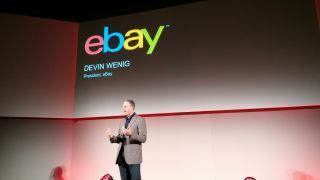 Devin Wenig, President of eBay, confirmed this deal with Argos is just a 'snippet' of what's going to be happening around the world, stating 'this is the way we see commerce going'. Apart from removing the panic at Christmas when you've forgotten to buy all your presents in time, this move is also about physical retailers looking to survive in an increasingly digital retail space. eBay believes this 'Click and Collect' model is the future of commerce, and will rise to 50% of online retail sales in the next five years. It's not the first time eBay has made moves on the high street; in 2011, it brought a physical shop to the streets of London for a week of offline Christmas shopping. The online retailer hasn't confirmed when the click-and-collect scheme will be rolling out to other parts of the world, nor when the trial may be extended. But this move marks a further blurring of the lines between the online and physical retail experience and gives 'retailers the chance to connect with technologically savvy consumers', according to Wenig. Apparently it's 4G that's going to change the way we shop... who knew?